The car and tech convergence continues. Self-driving cars, pedestrian-detecting cars, touchscreen infested cars, all-round connected cars. You name it, it was on offer at the Frankfurt Motor Show this year. It's an event on a massive scale, with single brands occupying show halls as big as what used to pass as the British Motor Show in London. But we've trawled every hall and every stand to bring you the best bits. The techiest, the slickest and the downright weirdest. Undoubtedly the star of the show. It's not just the fact that it looks like a concept car but it's actually just gone on sale in the UK for around £96,000. There's real substance to the style. First up is its carbon-fibre and aluminium composite construction. Then there's the radical re-thinking of what it means to be a supercar. The petrol engine is a mere 1.5l litres. But it cranks out 228bhp and also sports a lithium-ion battery pack for a grand total of 356bhp. The result is by far and away the most dramatic combination of performance and efficiency the world has yet seen. 0-62mph in 4.6 seconds and 155mph top speed on the one hand, 113mpg and just 25g/km CO2 emissions on the other. The i8's pure electric range, meanwhile, is 22 miles. It's right at the cutting edge for infotainment, too, with the latest build of BMW ConnectedDrive and NVIDIA-powered graphics. Now, it's true that those official figures don't take into account the emissions associated with the electricity used to charge the i8. And we thought its interior was a little conservative. But this is still a stunning effort from BMW and a probably game changer. So, Jag's doing an off-roader. What? Are we to expect a Range Rover Roadster, next? Actually, it's not as bonkers as it sounds. Premium-branded mid-sized SUVs are major money spinners and the CX-17 is one of the best looking yet. It also just so happens to pack plenty of tech including touchscreens, a wi-fi hotpsot and Jaguar's new aluminium architecture. It's only a concept for now, but we reckon an almost identical production version will go on sale in a couple of years. For sheer, giddy off-the-scale wantability, nothing at Frankfurt come close to the delightful, the delectable Porsche 918 Spyder. It's absolutely everything you could possibly want from a high-tech hypercar. The numbers are frankly insane. The combination of 875hp and 214mph on the one hand, 94mpg and 70g/km on the other, is unlike anything we've ever seen before from a true hypercar. If that's not enough, the lithium-ion powered part of the 918's hybrid petrol-electric powertrain allows for 20 miles of pure-electric range. Perfect for sneaking into city-centre zero emission zones. 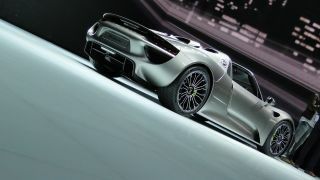 Oh, and the 918 also has the slickest looking touchscreen multimedia system we've ever seen. 'Nuff said. We're fans of self-driving car technology on TechRadar. One day, it will dramatically change the way we travel and live for the better. So, Merc's driverless S-Class prototype is right up our alley. It's at an advanced enough stage to have already managed the 56 mile drive from Mannheim to Pforzheim in Germany under its own steam. Or electronic brains. Even better, most of the technology used is already available on the new S-Class luxury car. Fingers crossed, fully automated driving will be available much sooner than the naysayers suggest. A two-tonne SUV on TechRadar? What gives? Actually, the latest Range Rovers are already surprisingly techtastic. There's the clever aluminium architecture which shaves off several hundred kilos, the touchscreen infotainmment with dual-view screens and the brainy digital systems that aid off-road traction. Not bad, eh? But now Range Rover is filling in the final piece of the puzzle with next-gen powertrains. In this case, we're talking diesel-electric but without plug-in charging. Even so, this V6 setup matches the straight oil-buring V8 for performance while guzzling 25 per cent less of the sticky stuff.